The 25th EU-Russia summit announced practical launch of the Partnership for Modernisation initiative. In a joint statement issued following the meeting, the sides noted the need to modernise economies and societies, stated the commitment of Russia and the EU to a joint search for answers to the challenges of current times, as well as their interest in strengthening their trade and economic partnership. In the document, the priorities in cooperation within the Partnership for Modernisation initiative were named as investment, innovation, small and medium-sized businesses development, technical regulations and standards harmonization, intellectual property protection, energy efficiency, judicial system effectiveness, fighting corruption, and strengthening dialogue with civil society. An agreement between the Government of Russia and the European Union on the protection of classified information was also signed. 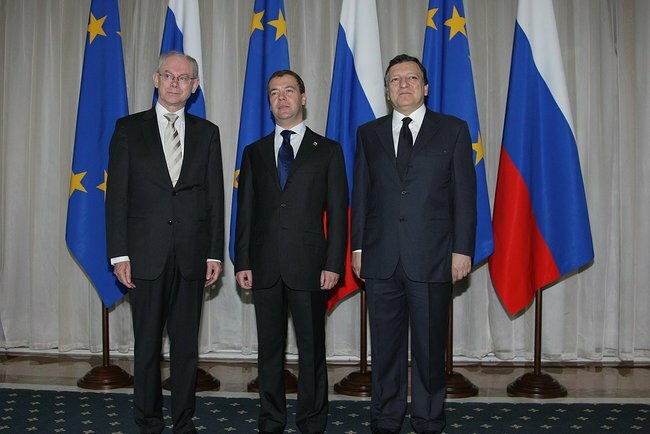 During the working meeting, various aspects of cooperation between Russia and the EU were discussed, as well as current issues on the regional and international agenda, including measures to overcome the global financial crisis, global and European security, Iran’s nuclear programme, and the Middle East settlement. Following the meeting, President Dmitry Medvedev, President of the European Commission Jose Manuel Barroso, and President of the Council of Europe Herman Van Rompuy gave a joint news conference.